A couple of weeks ago, Alastair Campbell, arguably Burnley FC’s best known fan after John Kettley, delivered two speeches about the state of journalism, and how it can regain the public’s trust. Like most national political commentators who seek to pass judgement on the media, ex-spin doctor Campbell failed to acknowledge the fact that, at a regional level at least, people do trust what they read, and rely on their local newspaper and its digital platforms for information day in, day out. It’s why Trinity Mirror’s regional brands recorded their best day ever last Thursday, and second best day ever last Friday, as gales gripped Northern England and big waves battered the North East. Anyway, I’ll save the ’10 reasons why Campbell is wrong about the media’ for another day – maybe when I’m full of christmas cake. The negativity disinterest and apathy call for politics to do a better job of defending itself. It also requires more political education, from a positive standpoint. Just as we teach kids that sport is good for them, we should teach that politics at its best is a good thing, and public service something they should aspire to not sneer at. We should lower the voting age, and introduce compulsory voting- with a “none of the above” option – in local and national elections. Russell Brand’s performance with Jeremy Paxman was electrifying TV, but dangerous. People should get involved. They should vote. And they should get into politics in whatever way can make a difference. The Press claim reverence for democracy, and regularly attacked us for “marginalising parliament”. The real marginalisation of parliament comes from the failure to report it. Jack Straw showed that between the 30s and the 80s, quality newspapers, when parliament was sitting, ran 800 lines of copy per day on average. By the early 90s, it was down to fewer than 100. Even on the Mirror, we had two fulltime gallery reporters. Now most papers have none, and Parliamentary coverage is by joke-smiths writing sketches, occasional clips from PMQs on TV with the question usually not what was it about, but who ‘won’? They might argue that it doesn’t sell. But in a democracy, the answer to that is ‘so what?’ A dedicated Parliament channel does not mean mainstream news should relegate Parliament as it has done. Perhaps sixteen gallery reporters for the Times was overmanning but these days, wander into the public gallery and regularly you’ll see a lone Hansard reporter recording proceedings. I found myself thinking about this while watching and listening to the round of Sunday politics shows yesterday as they relived the Autumn statement. Can you name anything in the Autumn Statement, policy wise? You’d have struggled yesterday, because it was all about Ed Balls, the shadow chancellor. Was his performance bad enough to cost him his job? Did the Tories shout over him to provoke his stammer? And so on and so on. At this point, Campbell’s argument seems to stand up – the media is more interested in the what, but the who, and that, according to Campbell, turns people off. Then I watched the clips of the Autumn Statement and concluded the problem doesn’t lie with what we write or say, but what is done in the Commons. The sight of shouting, screaming, shrieking men and women get paid decent salaries to determine so many aspects of lives is simply appalling. How much money the Government will take from us and how it will spend it are supposed to be the subject of the Autumn Statement – serious, big things. Yet the people Campbell expects us to trudge to the polls to vote for or reject think it’s acceptable to behave like a baying mob. In the case of the Tories, it’s trying to bring on Balls’ stammer. But don’t have too much sympathy for Balls – he likes nothing more than trying to derail the PM by making funny gestures at him during Prime Minister’s Questions. Yes, the weekly update the PM makes to parliament to answer questions from backbench MPs is actively undermined by the second most important man in opposition making hand gestures. Any trip up or slip of the tongue prompts cheers, boos, heckles or crowing from the back benches. Is this any way to run a country? It doesn’t matter whether they were educated at Eton or arrived via the Trade Union movement – not that the two need be mutually exclusive – they all appear to be quite literally the same. Having watched that, I don’t think Campbell should be cross that Parliament is relegated – in his eyes – to the BBC Parliament Channel, he should be positively grateful. If more people saw the full extent of the behaviour of our MPs in the Commons, politicians wouldn’t be worried about low voter turn out, they’d be worried about being barred from every self-respecting, trouble-dodging pub in the country. Put another way. Imagine if a company’s board of directors or a shareholders’ AGM descended into that? These guys run something far more important than a company – they run our world. Tory, Labour, Lib Dems, they all hate being told they’re as bad as each other, but, put simply, they are. There are many reasons why politicians have lost touch with the country, but it’s not the job of the media to make people care about the issues – it’s our job to report them. And that’s why select committees, in my view, get more attention in the Press now. Stories emerge from intense questioning of the people who impact all sorts of aspects of our lives, and not just politicians. And they conduct themselves, generally, very well. Who is to blame for politics becoming more about quick headlines and personalities, and less about substance of policy? I’d look to New Labour there – and to the Tories for doing so well under Cameron in opposition without any policies of note for three years. 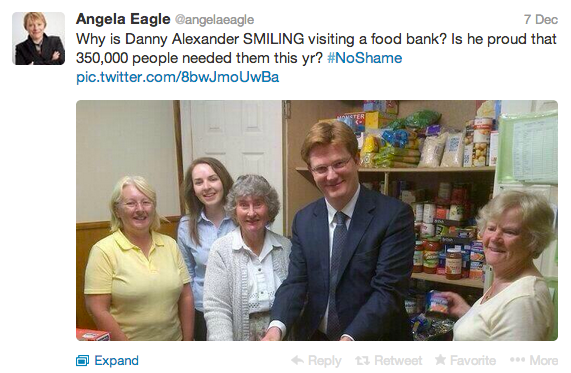 That’s a senior Labour MP trying to make an issue out of a rival MP smiling when he visited a foodbank. Why is he smiling? Probably because the four women around him are, clearly pleased he’s there. It’s that kind of petty, stick-the-boot-in personal point scoring which does more to make the public switch off than anything else. From a one-to-one Tweet to 650 screaming politicians in the Commons, it’s that approach to life which is making people switch off. If politicians want the public to get involved and care, they need to start behaving like grown ups. It’s nothing to do with the media, nothing to do with public. The buck stops with the politicians themselves … no matter how much their chief defender Campbell wants to argue otherwise. For me the saddest thing about this, from the point of view of a regional reporter of a good few years now, is how this tribal attitude to politics at Parliament can be seen filtering down at all levels. At county level, I sort of expect it, they are career politicians after all, but when you turn up to see borough council meetings that are more like pantomimes with the same old cliched arguments being thrown around, and even worse seeing it hijack issues at parish council level, it is no wonder that election turnouts are so low. The Mirror’s associate editor and political commentator Kevin Maguire told a seminar arranged by the Welsh Assembly it didn’t have enough conflict and was simply ‘too boring’ to warrant coverage in the national (London) media. Having watched Welsh Assembly questioning of Welsh Government ministers I can understand Kevin’s comments and since the body first sat (in 1999) have been struck by how dull the simple question and answer format is without the ‘(un) Parliamentary Punch and Judy’ sideshow. That’s not to say there haven’t been memorable moments on the floor of the Senedd on the rare occasions an opposition Assembly Member has asked a killer question. There are also occasions when the Senedd has hosted ‘shouting matches’ – which according to the body’s rules are quickly stamped on by the Presiding Officer (speaker) – and it seems, in my opinion, these are now the Senedd occasions which are getting the most coverage, especially on the Welsh TV news.